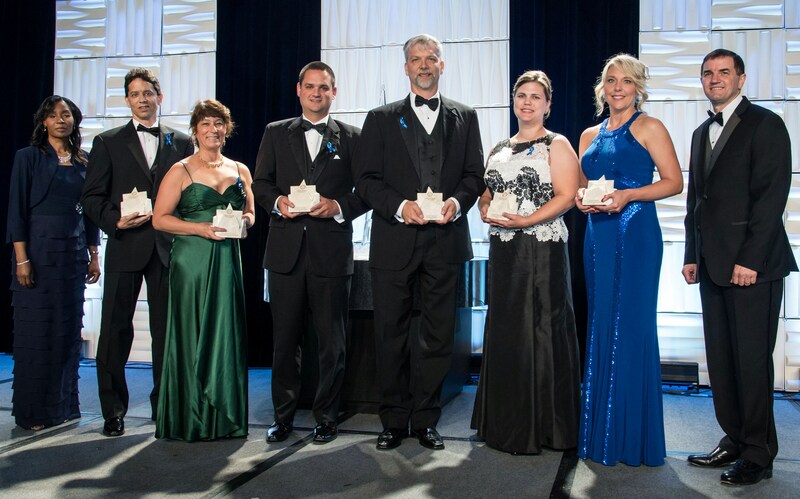 The Rotary National Award for Space Achievement Foundation honored the dedication of the space workers at the annual Space Awards Gala on Friday, April 29, by presenting the Rotary National Award for Space Achievement Stellar Awards. Every year, the aerospace community anxiously awaits the announcement of the Rotary National Award for Space Achievement Stellar Award winners. The 2016 Stellar Awards Evaluation Panel, Dr. Glynn Lunney, Arnold Aldrich, Col. Eileen Collins and Michael Coats selected the winners based on which accomplishments have advanced U.S. space capabilities and hold the greatest promise of future capabilities. Out of 137 nominations received, the Panel selected 19 individuals and 7 teams for recognition. 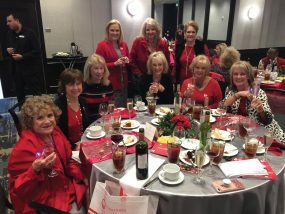 Prior to the evening’s festivities, all nominees were treated to a behind-the- scenes tour of the Johnson Space Center and a luncheon at South Shore Harbour Resort. Stellar Awards Committee Chairman Jennifer Devolites welcomed the nominees and then said, &quot;You are here because you are excellent.” She asked the nominees to consider using their excellence to provide leadership to others, take on mentoring, and to also take risks and get outside of their comfort zones with regard to what they already do well. Capt. Sunita Williams was the featured speaker at the Stellar Awards Luncheon. Launched on STS-116 in December 2006, Williams joined the Expedition 14 crew onboard the International Space Station. She completed three spacewalks in 2007, setting a new record for spacewalk time by a woman that stood until December 2008. Upon landing in June 2007, she had spent a record-breaking 194 days, 18 hours and 58 minutes in space. Each nominee received a Fisher Space Pen donated by the company. The Fisher Space Pen was originally carried by the astronauts on the Apollo moon missions and is still used on manned space flights to this day. They are precision assembled, hand tested, and guaranteed to perform underwater, at any angle including upside down, in extreme temperatures, and of course in zero gravity. All the Stellar nominees had their photo taken as they received a special commemorative certificate with a United States flag that was flown aboard the Space Shuttle Endeavour, STS-108, Dec. 5 – 17, 2001. 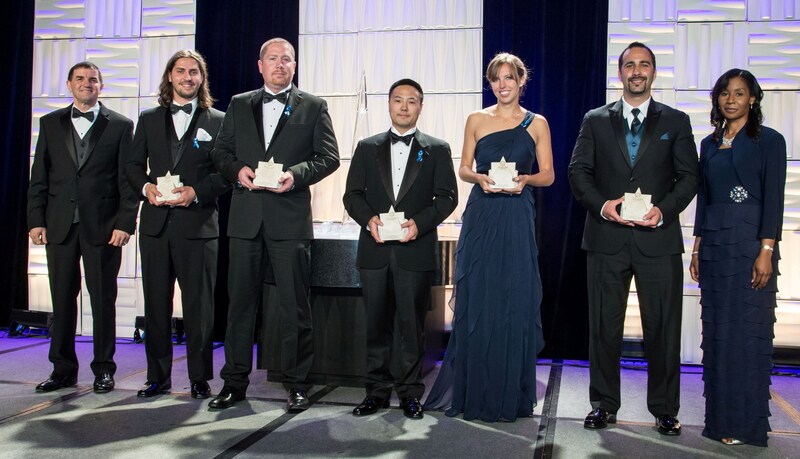 Stellar Award Winners – Early Career, from left, Rex Walheim (presenting), Kiril Dontchev, Dr. Brien Flewelling, Alan Kim, Sarah Baldwin, Anthony Cook, Stephanie Wilson (presenting). Sarah Baldwin of Aerojet Rocketdyne – Outstanding leadership, technical excellence, and innovation in flight operations contributing to the 100% mission success of the rs-68 rocket engine. Alan Kim of The Boeing Co. – Engineering excellence in solving difficult stress analysis challenges for SLS. Dr. Brien Flewelling of the U.S. Air Force Research Laboratory – Outstanding contributions to image processing and computer vision applied to advanced space object detection, tracking, identification, and characterization. Cora Treacy of UTC Aerospace Systems – Outstanding management effectiveness in support of the eatcs, eclss and regenerative eclss on-board the international space station. Kiril Dontchev of SpaceX – Recognized for exceptional leadership overseeing the pad abort test of the crew dragon spacecraft’s integrated launch abort system. Anthony Cook of The Boeing Co. – Outstanding leadership and technical contributions to development, implementation, and delivery of new iss nitrogen/oxygen resupply system compatible with multiple launch systems. Connolly, Lorraine Prokop, Anthony DiCello, Bruce Sommer, Leslie Robertson, Shelia Sharp, Rex Walheim (presenting). Not Pictured: Judith Blackwell-Thompson, Lt. Col. Christian Elenbaum. Leslie Robertson of The Boeing Co. – Outstanding technical knowledge and ingenuity in development and deployment of compiler, patch and review tools for the iss program, including training and support across iss software development teams. Bruce Sommer of Lockheed Martin – Outstanding human spaceflight contributions for improving iss and orion mpcv crew safety and ensuring mission success. Judith Blackwell-Thompson of NASA Kennedy Space Center – Exemplary leadership and sustained contributions to manned space flight launch planning and execution. Anthony Dicello of The Boeing Co. – Exceptional leadership contributions of the development of the first two international docking adapters which will adapt the international space station for docking by the next generation of commercial crew transportation systems. Lorraine Prokop of NASA Johnson Space Center – Pioneering contributions to aerospace software engineering, including significant advances in human spaceflight software affordability. Paul Connolly of Pratt & Whitney – Outstanding contributions to understanding the ORSC cycle and its operation in the rd-180 rocket engine. Lt. Col. Christian Elenbaum of U.S. Air Force – Exceptional contributions to space based infrared systems program reducing satellite production costs over one billion dollars. Sheila Sharp of The Boeing Co. – Outstanding accomplishments in the leadership, mentorship and development of critical teams in the definition, design and integration of program requirements and resolution resulting in program progress, compliance and overall performance. 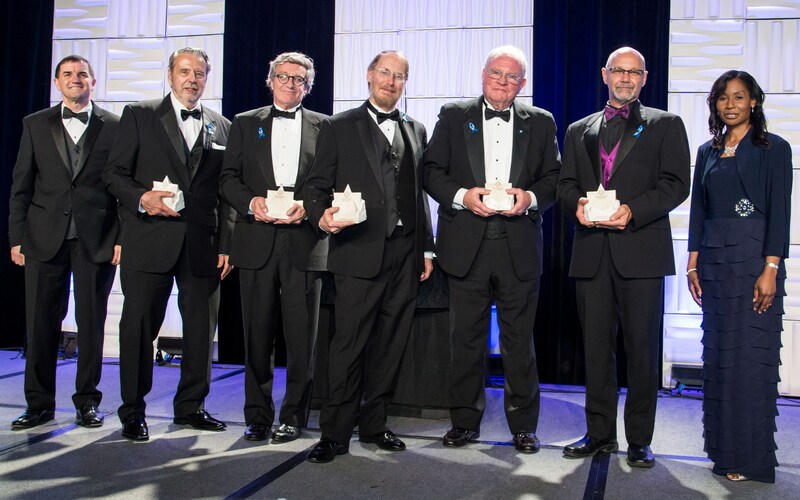 Stellar Award Winners – Late Career, from left, Rex Walheim (presenting), George Dickey Arndt, Laurence Price, Dr. Geoffrey Landis, Mark Craig, Robert Brazier, Stephanie Wilson (presenting). Mark Craig of SAIC – Outstanding career of service to NASA dedicated to improving the value of human space exploration spanning Apollo, space shuttle, space station and beyond. Dr. Geoffrey Landis of NASA’s Glenn Research Center – Exceptional technical achievements and leadership in developing photovoltaic power systems and advanced concepts in support of NASA missions. 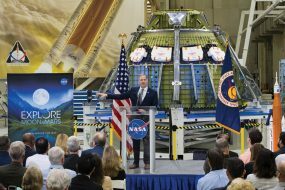 Lawrence Price of Lockheed Martin – Outstanding leadership and international collaboration to take the Orion program from development to space flight vehicles for NASA’s human exploration missions. George Dickey Arndt of Johnson Space Center – Outstanding dedication to exceptional electromagnetic technology development utilizing collaborations from within and outside the agency. Robert Brazier of Aerojet Rocketdyne – Invaluable contributions and leadership in the production of liquid rocket propulsion in support of the advancement of America’s space programs. Stellar Award Winners – Team, from left, Rex Walheim (presenting), Andrew Zarechnak (OA-4 Return to Flight Team of Orbital ATK), Unidentified team member, Corey Duncan (Automated Navigation and Guidance Experiment for Local Space Program Team), Debbie Sharp (ISS Hardware Recovery Team), Carolyn Gernux (Fan/Pump/Separator Bearing Corrosion Anomaly Resolution Team), Yasmin Ali (Pendulum Team), Janine Cuevas (EFT-1/Orion Aerojet Rocketdyne Propulsion Team), Brian Jones (Orion EM-1 Critical Design Review Team), Stephanie Wilson (presenting). EFT-1/Orion Propulsion Team of Aerojet Rocketdyne – Outstanding team dedication and attention to detail during development, production, flight readiness, and flight, resulting in significant achievement on orion eft-1 and paving the way for advanced future space activities. Award accepted by Janine Cuevas. Pendulum Team of Johnson Space Center – Outstanding team effort in mitigating the orion pendulum motion anomaly. Award accepted by Yasmin Ali. Fan/Pump/Separator Bearing Corrosion Anomaly Resolution Team of UTC Aerospace Systems – Outstanding achievement in preparation for and execution of a contingency eva to eliminate an ammonia leak that jepordized the international space station. Award accepted by Carolyn Gernux. International Space Station Hardware Recovery Team for Launch on HTV-5 of The Boeing Company – Quickly accelerating manufacture and test of hardware, and rebuilding several critical hardware items for on-time delivery to meet the htv-5 launch, support on-orbit operations, and support crew health and safety. Award accepted by Debbie Sharp. Automated Navigation and Guidance Experiment for Local Space (Angels) Program Team of U.S. Air Force Research Laboratory – Outstanding team achievement in evolving the air force’s ability to responsively perform space situation awareness missions. Award accepted by Corey Duncan. OA-4 Return to Flight Team of Orbital ATK – Outstanding technical and management excellence in providing timely reinstatement of cygnus cargo resupply services to the iss. Award accepted by Andrew Zarechnak. Orion EM-1 Critical Design Review Team of Lockheed Martin – Excellence in preparation, execution and follow through of the orion exploration mission critical design review that resulted in nasa’s authorization to proceed to spacecraft production. Award accepted by Brian Jones. Visit http://www.rnasa.org/photos.html for images from the event. Individual photos of each nominee and winner are available upon request. to heart. There’s some validity but I am going to take hold opinion until I look into it further. Great article , thanks and we want more! 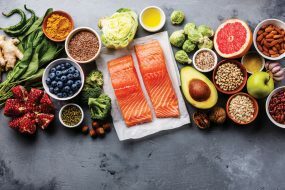 Added to FeedBurner as well.